ACO Toronto and Old Toronto have released a ten-minute video that highlights the architectural history of Ontario Place. ACO Toronto is asking Ontario residents to share the video link with their MPP. Concerns over the redevelopment of Ontario Place have led, over the past weeks, to a rallying of support by advocates for the built environment. 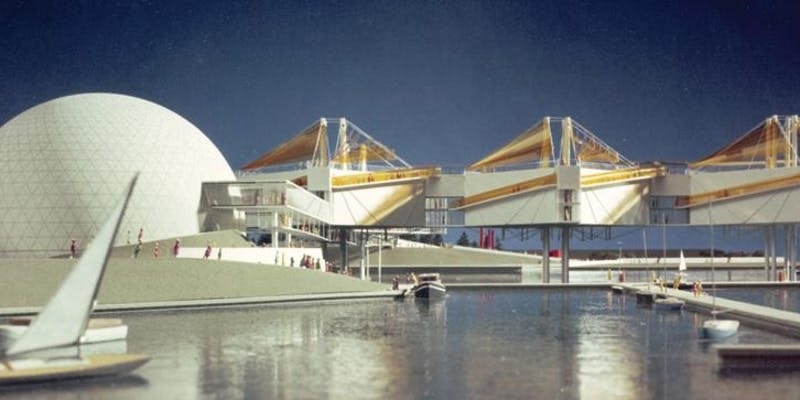 This arises in response to the Ontario government’s announcement of a new Expression of Interest seeking development concepts for Ontario Place, which opens the possibility that the site’s signature Cinesphere and Pods could be demolished. The group Ontario Place for All says that more than 1.4 million people visited Ontario Place last year, not including those who went to Budweiser Stage and Echo Beach. That’s equivalent to the number of people who visited the CN Tower. As well, the Ontario government spent $28 million dollars building Trillium Park and the William G Davis Trail at Ontario Place. The government has now decided these popular additions could be plowed under. Ontario Place’s programs have been self-funded. It received no operating subsidy in 2018, just capital grants. A recent Forum Research poll (conducted Jan 15-17) found that 87% of respondents felt access to the waterfront is important. 61% said they would be unlikely to visit a casino at Ontario Place. On February 19, the Architectural Conservancy of Ontario (ACO) and Toronto Society of Architects (TSA) hosted a panel discussion to discuss the important architecture and landscape design heritage of Ontario Place and how all Ontarians will benefit if we continue to build upon the site’s valuable cultural heritage legacy. Highlights of the event are included in the recently issued video, including a talk by the heritage structure’s main designer, Eb Zeidler. Coming up on Saturday, March 30, the Toronto Society of Architects invites architects, designers, and community members to explore the future of Ontario Place through a one-day public design charrette. The cross-disciplinary event will be held at the Central YMCA. The ideas and discussions generated in the charrette will be documented and made available to the Government of Ontario and the general public. It is free to attend, but registration is requested at this link. The group Ontario Place for All has formed around the principle that Ontario Place must be kept publicly accessible, whatever redevelopment plan is proposed. Before any changes, the group believes, there must be a thoughtful, comprehensive public review, with a full and robust public consultation. Public interest, not commercial interest must drive the new vision. and be integrated with the revitalization of Exhibition Place. A pre-formatted letter is available to e-mail to Premier Ford, Culture Minister Michael Tibollo, and Toronto Mayor John Tory at the Ontario Place for All website. The Ontario Place Cinesphere and Pods received the 2017 RAIC Prix du XXesiècle, recognizing their enduring excellence and national significance to Canada’s architectural legacy. Over 1,600 people have signed a petition asking for the preservation of Ontario Place.